The main purpose of recording factory losses is to understand where we are losing time, speed, quality and ultimately money. This allows us to focus our (limited) resources by identifying the big problems across the manufacturing elements of our factory and profit centres. Further, continuous monitoring, even when there are no problems, allows us to be in full control of the plant and to measure the effects of our improvements to quickly identify where problems are emerging. A factory’s loss system is the essential ingredient in providing “facts” for decisions in an improvement programme. Loss collection is mainly focussed on the production, packaging and engineering facilities within a site. It attempts to capture stratified information about Quality, Performance, Maintenance and Skill issues. This is the antipathy of the Finance System, which is focussed on what we have made, whereas the Loss System measures and analyses the plant when it is not making product at the required quality and within the required time period. There are 16 Major Losses as can be seen in the table below. Most factories that measure loss, only record a few of the losses shown on the right hand side. These are the Machine Losses and are probably the best place to start out. The left hand set of losses are much more about “People” and require a more mature attitude by both management and employees to measure them, let alone tackle them. 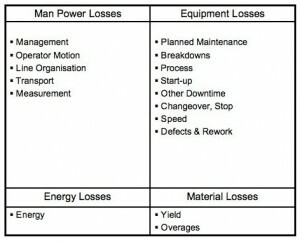 The Key Performance Indicator (and we stress indicator) for equipment losses is OEE (Overall Equipment Efficiency). This is the only indicator, which combines an effective measure of a site’s Availability, Performance and Quality. There are those who are sceptical of sites who claim to have greater than 80% OEE, however, OEE is really a measure of a sites progress as part of a continuous improvement programme. If we start measuring OEE at 30% and change nothing about the way we measure then if after 3 months we have achieved 40% and the other key measures have changed, e.g. increased Volume and reduced Utilisation, then as a site we have reduced our price per product. As with all KPI’s it is what is excluded rather than what is included within the measure that determines how real the measure is. The most common exclusions are time lost for Changeovers and Meetings, two of the largest losses a site may have. This entry was posted on Thursday, July 29th, 2010 at 16:19	and is filed under TPM. You can follow any responses to this entry through the RSS 2.0 feed. You can leave a response, or trackback from your own site.